Tips and tricks for better living through healthier eating. Crush pink peppercorns with a mallet or heavy-bottomed pan. Chop fresh basil. Combine with all other ingredients for the sauce. 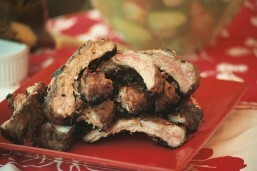 Slather the ribs liberally and place into a baking dish. Marinate overnight if possible. Cover and bake at 300º for 1 hour. Then reduce temperature to 175º and bake covered, for another 3-5 hours. This can be done the day before and refrigerated overnight. Uncover and broil for 3 min each side immediately before serving or place on a BBQ grille to thicken the coating and brown. Grill with indirect heat (coals on one side and ribs on the other side) with the lid down. For that fall-off the-bone tenderness, use few coals and replenished when necessary so temperature is very low over a prolonged period. Soaked wood chips make a nice extra touch of smoky flavor. Slather with additional coat of BBQ sauce and finish for 3 minutes each side over direct heat for that finger-lickin’, sticky goodness that says 4th of July! Use your credit or debit card via Paypal to purchase the first volume of The Enlightened Cook cookbook series: Protein Entrees. The book is full of photo and healthy fish, poultry and red meat recipes that are easy to follow and great for you.